Born in the small town of Argyle in Tobago, Winston Duke moved with his family to New York City at the age of nine, after his mother, a single parent, sold their family restaurant and gave up her government job in order to support her daughter's (Winston's older sister) dream of becoming a doctor. The family ended up in Rochester, New York by the time Winston was of high school age. A shy kid, Winston withdrew into himself, until his 10th grade Spanish teacher took notice of the energy and life Winston brought to his presentations. She signed him up for the school's theatre club, which would eventually lead him to studying theatre at the University of Buffalo. Following his graduation, Winston achieved his Masters in Fine Arts at Yale's School of Drama. There he would become close friends with future Black Panther co-star and Oscar-winner Lupita Nyong'o. Winston graduated from Yale in 2013 and landed his first television role a year later in an episode of Law & Order: Special Victims Unit. He would follow that up with recurring roles on hit TV series such as Person of Interest (2014-2015) and Modern Family (2016). He would truly break out with the release of Marvel's Black Panther in 2018. 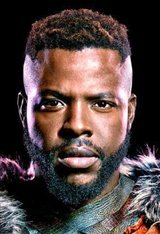 Taking on the role of M'Baku in the star-studded cast, Winston instantly became a fan favorite, and went on to reprise his role in Marvel's next film, Avengers: Infinity War (2018). Winston was also seen in writer/director Jordan Peele's highly anticipated second movie, titled Us (2019), starring as Gabe Wilson alongside his old friend, Lupita Nyong'o.